Leslie Basham: Before you know it, spring will be here. Serious gardeners are already planning what they’re going to plant. Serious gardeners like Erin Davis. Erin Davis: I grow green beans. I grow potatoes. I grow tomatoes. I grow corn. I grow beets. I grow turnips for my husband’s grandmother. She loves my turnip gardens. I grow herbs. I grow onions. Carolyn McCulley: You go, girl. Wow! I’m impressed. Leslie: Erin was with a group of friends talking about gardening—friends like Carolyn McCulley. Erin: There goes your basil. Karen Loritts: When I moved from the big concrete jungle of Philadelphia down to Georgia, we had all this green stuff. I had my husband plot me up a little patch. We only lasted one season. It was just too much work, and we had too many nasty things. Leslie: Mary Kassian likes garden, but in Canada where she lives, she’s been struggling with a certain kind of pest. Mary Kassian: This was a bad year for slugs. They kind of sneak up, but you often see their trails. Erin: Oh, right. We don’t have slugs. We have Japanese beetles. I live in Missouri, and the rule of thumb in Missouri is if you see one Japanese beetle, 10,000 of his little friends are already there. They can turn your crops to lace in just one day. Mary: Every pest usually has some contribution to the ecosystem, but I’ve yet to figure it out about slugs. I mean, what is their benefit? Leslie: Today on Revive Our Hearts we’ll continue talking about a garden and a dangerous invader that threatened that garden—more dangerous than a slug or a Japanese beetle. This group of friends got together to talk about the workbook, True Woman 101: Divine Design. It was written by Mary Kassian and our host, Nancy Leigh DeMoss. We’re about to hear the part of the conversation these friends had about True Woman 101. Keep in mind, this is less an interview like you usually hear on Revive Our Hearts and more of a conversation with a lot of give and take. I think it will provide some very important things for you to think about. Here’s Nancy. Nancy Leigh DeMoss: Okay, I’ve got a really important theological question here. Mary: Oh, wait, I have more bug stories. Nancy: Garden of Eden, Paradise—do you think they had slugs and Japanese beetles? Karen: Oh, no. They’re definitely the result of the Fall. Carolyn: No, I don’t think so. Mary: No—and there were no mosquitoes and stink bugs. Nancy: Okay, but here’s the point I would like to make. We all agree that in the Garden, Genesis 1, Genesis 2, it was paradise. We don’t know for sure whether those critters were there—beauty is in the eye of the beholder. Maybe Adam and Eve just loved slugs—we don’t know. Karen: They might have had a pet bug. Nancy: We do know that—get away from the critters for a moment—talk about the people there. Adam and Eve, this first couple, first marriage, first man, first woman, it was paradise for their relationship—their relationship with each other and with God. It is hard to imagine. Mary: It’s hard to fathom. No holes in the leaf. Erin: No Swiss cheese in the leaves or in the relationship. Nancy: Okay, something has clearly changed. Nancy: We all know the story, but I think it’s just really helpful to go back and reflect on it from time to time because in Genesis 1 and 2, you have this awesome, amazing—every word in there is positive, it’s blessing, fruitful, good, wonderful. This is a perfect paradise for this couple. They are not only right with each other—a great relationship with each other—but a great relationship with God—no hindrances, no barriers, no fear, no shame, no guilt. Then you come to chapter 3 of Genesis, and something drastic happens, something really stark that paints this really negative picture until you get to the New Testament and to the last three chapters of the Bible where you have restoration of paradise. 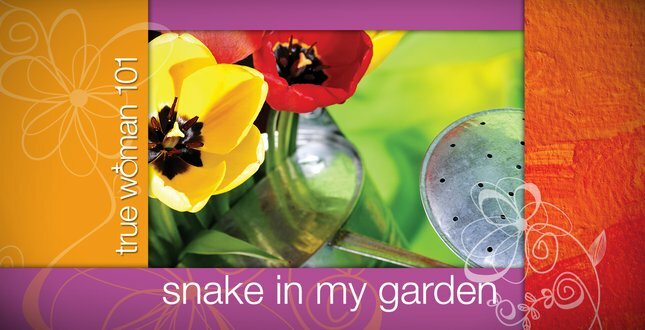 In Genesis chapter 3 we have the entrance of a critter, a snake, a pest into the Garden. Nancy: And not just slugs or Japanese beetles or things that destroy our physical gardens, but a spiritual being that set out to destroy and to undermine and to dismantle all the good that God had put there. Karen: He came there with a plan, crafty. He was there just to upheave all of this beautiful paradise, this garden kind of atmosphere. Nancy: He had an agenda. Karen: He didn’t want to just destroy crops. Carolyn: He wanted to do much more damage than that. Nancy: But here’s the thing: He didn’t look like a pest. Mary: No, he didn’t look like a pest. Nancy: He didn’t look like an intruder. Karen: No. He looked like one of the other created beings. Erin: Right. I mean, with the curse he’s commanded to crawl on his belly. So, we don’t know what he looked like prior to that. Nancy: He could have been upright. Carolyn: He could have had some limbs or something—certainly not as snaky and creepy. Karen: It was obvious he was more appealing. Mary: He must have been quite beautiful, really; I would imagine. Nancy: Because if it were today and we saw a snake coming to our view, we’d be out of there shrieking, but somehow Eve wasn’t afraid. She didn’t screech. There was this conversation. People are saying today this is all folklore, but it’s not. It’s true. He approached the woman. We're talking about true womanhood here. If we're going to understand how we got to where we are today and why we have the issues we do, we've got to go back to this moment of temptation. He approaches with her a . . . We know the serpent is Satan embodied in the body of a serpent, but he has this deceptive sales pitch. Carolyn: He has the first question in all of Scripture. The first question is to cast doubt on God's character, His truth, and His Word. That's been the same assault from there on out—one trick, but it works. Mary: Yep. Don’t you think you know better than Him? Mary: Is He holding out on you? Nancy: It was the first sense of inadequacy. Karen: Or how about this: He comes to Eve, and she's perked up because maybe now she has something her husband doesn't have. So she has one up on her man. Carolyn: Someone paying a whole lot of attention to her. And can’t that be dangerous? Mary: Well, it’s very attractive, certainly. Scripture tells us that she was pulled in by it. She didn’t go, “Oh, I’m going to sin.” She was just tricked by it. She was led along into the sales pitch, into buying something that she thought looked really great. And she swallowed it hook, line, and sinker. Nancy: I want us to just explore how that happened and why. I mean, we know this passage, it’s familiar, but sometimes we just have glazed over eyes with these familiar passages. I think it bears exploring because God had posted one “keep off” sign in this whole amazing garden—just one. She had all this other stuff to enjoy. How does Satan succeed in getting her go where God said don’t go? Mary: As a woman, I can just so relate with Eve. I’m not sure I would have made a different choice. In fact, I probably wouldn’t have. I can just see from a woman’s heart and understanding what makes me tick, even the things I don’t like about what makes me tick, how that happened. Nancy: What did she find so compelling about his pitch? Nancy: But why was that compelling to her? Mary: I see your point. I think because women are relaters. We like to relate, and we’re created for relationship. So if you come to me and you tell me something and I can see the truth in it, I’m drawn to that. Mary: Don’t we women all want things that look good. I know I like things that taste good. Carolyn: That was Satan’s assault. He wanted to be just like God. Nancy: Right. That’s how he got thrown out of his responsibility in heaven. Nancy: And God’s ways are too restrictive. That doesn’t seem fair. Karen: And He has you all boxed in. Mary: Or you could be so much more if you took things into your hands. Is He really looking out for you as much as He’s looking out for Himself? I know my desire for control sometimes leads me to entertain the snake, I guess. Nancy: Which is strictly contrary to what God had said. Mary: “You surely aren’t going to die. Oh, come on. It can’t be that bad.” I mean we fall for that all the time. Nancy: “Double the pleasure; none of the guilt.” Right? Carolyn: He casts the doubt, and then he completely contradicts. “You will not surely die.” I wonder if she even really understood what death was. I mean in paradise, it probably was a very abstract concept. Mary: She’d never seen it. Karen: Her question should have been—not only her response, but her question should have been, “How does he know what God said? I was there listening to what God said.” She should have questioned that, but, of course, we never question the bearer of the news as contrary to what God says. Right? We always say, “Oh, well, I don’t know.” When God specifically has it penned out for us in His Word. Mary: Yes, but we don’t like that. I don't like that. I don’t like keep off signs or don't go there. In fact, I find in my own spirit that when there's a don't go there, it makes me want to go there more because I don't like feeling like someone else is putting restrictions on what I can and can't do. Nancy: Yes, I sometimes say I don't mind doing what's right as long as somebody doesn't tell me I have to or that I can't. That's rebellion, right? Karen: That's what we have. Can you imagine my little kids? I can have a jar of Oreo cookies right there in the middle of the table and have maybe a peanut butter and jelly sandwich right here. And I say, “You may have all the cookies you want, but don't touch this peanut butter and jelly sandwich.” I have shifted their attention from the cookie jar to the sandwich. Erin: You could use vegetables as an alternative, and they’d . . .
Carolyn: Sure! Don’t eat the broccoli! Karen: There’s something appealing about what you say I can't have. Nancy: So Satan makes it look attractive. It does look attractive. It was attractive. But then he makes it look harmless. It looks promising. She buys into it. Of course, if she could have seen it looked like it was just crawling with worms and rotten, she wouldn't have gone for it. It looks so attractive, but then she takes a bite, and you find it is crawling with worms, so to speak, and the rest, as they say, is history. But, Erin, I'm so glad that you pointed out that we would have likely made the same choice. Erin: Oh, I'm such a daughter of Eve, and I prove it by repeating her mistake so often. Nancy: Exactly, so how does Satan tempt us today as women in ways similar to what he did Eve, and how do we respond to it. Erin: Well, I find his tactics haven't changed all that much in my life. I didn't think anything bad would happen. It wasn’t going to happen to me. I thought my life would be better. I thought God's rules were a little bit silly. I thought that I could make the choices. Carolyn: Well, the current lie to our culture is the fact that there is no judgment, there is no death, there is no hell. Nobody is going to hold you accountable, so just make up your own rules, and do what you want. And then inside the church . . .
Mary: If it feels good. You should not deny yourself. Don't let yourself be denied. You keep postponing obedience, and so that's one aspect that affects us here in the church, and it's just that same idea that God's judgment isn’t worthy of our respect or consideration. Mary: A technique that Satan uses that I can so relate to is he made it all about Eve. For a minute, he gave her a stage, a platform, to think, “It’s all about me.” And sin in my own life is so often traced to, “It’s all about me.” Just momentarily forgetting that it’s not about me. When I think it is about me, I give myself the right to behave any way I want to behave. That’s what Satan did with Eve. “Here’s your stage, Eve. Invent the life you want. Let’s talk about you.” When I get to talking too much about me, it’s ugly usually. Nancy: We do forget or ignore consequences. I'm thinking about Psalm chapter 10. Three times it says, “He says in his heart.” It's talking about foolish people, people who have sinned, make sinful choices. “He says in his heart, ‘I shall not be moved; throughout all generations I shall meet adversity.’” (v. 6) I'm going to be able to continue my life as it is. And isn't that it? We may not be consciously saying that at the moment of temptation, but if we really were thinking, “I will give account. God hasn't forgotten. He does see.” That's the fear of the Lord, living in the constant, conscience awareness of God's presence. How would that keep us from sinning? Mary: He's the creator; I'm the creature. This is not about me; this is about Him. If those are the boundaries that He's established, who am I? I mean, we don't fear, we don't tremble at who God is anymore. There's just this casualness. Mary: Yes. Too casual. Like, “Oh, yeah, yeah. It's all about me. He'll forgive my sin.” There's no fear in terms of understanding that He indeed is God, and I am not. Karen: In Galatians, where it has that sowing and reaping principle—I’m going back to the garden. The only thing I do know about garden seeds is that whatever seed you plant in the garden—if it’s a green bean or whatever . . .
Nancy: If you plant a tomato, you’re not going to get a cucumber. Karen: Was she out of place in this part right here? It would be nice to find out geographically where she was. Erin: Well, Adam was standing right next to her, and there’s no consultation. There’s no, “We’re in this together.” There’s no, “My behavior impacts other people,” here. It’s just all about me. That’s just such a lie and temptation for women to believe that, “My behavior isn’t going to impact others. This is an isolated thing. What I do is for my happiness, and I’m the only one who’s going to be impacted, and there won’t be any consequences to speak of." Karen: Which is a big lie. Erin: Oh, I see it all the time. Women in affairs. It’s just all the time in terms of the choices that we are making. Nancy: And it’s for sure God’s business. Karen: That’s right. So you have to make a decision. We just go on and have this conversation, but they have this idea, “What I do is my business. I can do whatever I want because there’s not going to be a time of harvest.” There will be a time of harvest. Carolyn: But women are the originator of that idea. Erin: We’re such influencers that when we make decisions, it influences and impacts those around us. Mary: It certainly happened in the garden. Nancy: Okay. So how does the cultural ideal today for womanhood tempt us to fall for Satan’s deception? Tie those two together. We’re talking about sin in general, temptation in general, but as it relates to true womanhood or womanhood, culture has an ideal, and how does that set us up if we buy into that ideal, to fall for Satan’s deception? Mary: Put away that ten-times magnification mirror. Carolyn: Exactly. And we fight against it. I fight against it. Just the idea that I am supposed to decay because, in my humanity, in my humility, I slowly crumble. Nancy: But we’re always looking for this anti-aging thing that will keep us perennially nineteen. Carolyn: Exactly. I’ve spent tons of money on that. So the idea is that youthfulness is better because it’s that eternal value. Theologians have speculated that Adam and Eve were probably young adults, in their prime, and that would have been their perfection. That’s where they would have stayed. There wouldn’t have been this aging process that kicks in. We fight that. Carolyn: Right. We fight it because we don’t want to acknowledge our "creatureliness" that leads us from dust to dust and back to dust. Erin: Beauty has always played a huge role. You asked how it’s affecting women today. I think Eve was drawn to beauty, wanting a version, maybe, of beauty she maybe didn’t think she possessed—and isn’t that traced to a lot of sin we’re seeing in women’s lives now? Anything to be beautiful, anything to feel beautiful, anything to be told you’re beautiful. Erin: That’s right. I’ll take it any way I can get it from anyone who wants to say it to me as long as they will affirm me. Mary: Especially if it’s a good looking guy. Nancy: But hasn't that been drilled into us for as long as any of us have been alive? Mary: It was born into me. Nancy: But our culture promotes that. Erin: Oh, certainly, and isn’t it still tied to our sins as women, so often? Mary: Oh, there's some cuddlers, but on their own terms. Mary: God created us, I think, in terms of development and maturation where there’s a sense that independence is a healthy thing, but there's also a very unhealthy thing there. I think that Satan was really appealing to that part of Eve—the part where she exerted an independence that was unhealthy. It wasn't because she turned her back on interdependence. I mean, there were so many temptations that were so subtle and so undermined who God created them to be as male and female. That's what is so fascinating to me. This is not just an ordinary temptation. This really speaks to who they are as man and woman and really what appeals to a woman the most and what is most tempting and really it does play into what tempts us to this very day. Leslie: That’s Mary Kassian. She’s been talking with Nancy Leigh DeMoss along with their friends, Erin Davis, Carolyn McCulley, and Karen Loritts. That conversation is based on the book Nancy and Mary wrote called, True Woman 101: Divine Design. It’s a workbook that will help you consider what God’s Word has to say about being a woman. It will help you ask the Lord how He wants you to live day by day as a woman. Heather Patenaude is a Revive Our Hearts listener who visited us not long ago and told us how this workbook affected her. Heather Patenaude: True Woman 101: Divine Design is an eight-week Bible study. Grab a group of girlfriends and understand what biblical womanhood is. The more that I have understood why God created me as a woman and how I am to function as a woman in the body of Christ, it’s changed my marriage. I had a fabulous marriage before I went through True Woman 101 or went to the True Woman conference, but God has taken it to another level of amazingness because I have understood my role as a wife and my role as a daughter of the King more. Watching my husband respond to my changes . . . He always says to me, “If you want to go to True Woman, fine. You can go to anything Revive Our Hearts does, because when you come back, you are a completely transformed woman.” So he is completely supportive of any time I want to be involved with anything with Revive Our Hearts or the True Woman movement. Leslie: We’d like to send you the workbook Heather has been telling you about. When you donate any amount to Revive Our Hearts, we’ll send you True Woman 101 from Mary Kassian and Nancy Leigh DeMoss. Ask for it when you call 1-800-569-5959, or visit ReviveOurHearts.com. Well, tomorrow we’ll pick back up on the conversation we began today with Nancy, Mary, and their friends. We’ll hear how the events in the Garden of Eden are still affecting relationships today. Please be back for Revive Our Hearts.